Operating Era: 1949-1960. Recommended Trucks: Tahoe TMW-212 Andrews. 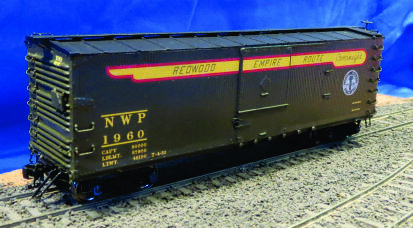 These Express cars were rebuilt by NWP from their 100 USRA DS box cars in 1939. See Our Kit #3818 for that version. After WWII, the NWP repainted the cars with a colorful "Redwood Empire Route Overnite" banner down the length of the car. 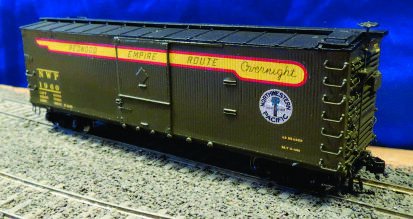 Our Kit features an improved one-piece body, the original's full color lettering, AB brakes, Passenger steam, signal and air lines, etched sill steps and many other details. This and other new Series of Westerfield Kits is available with Tahoe trucks (Code 110 or 88) and Kadee Couplers (#5 or #158). Please see individual Kit listings for details. PLEASE SEE OUR NEW KIT RELEASES SECTION FOR MORE INFO ON THE #12400 SERIES KITS.